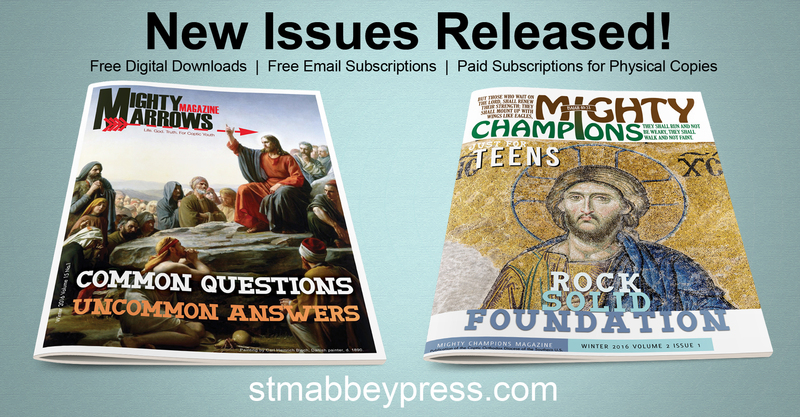 St. Mary & St. Moses Abbey Press > New Magazine Release > New Magazine Release! The latest magazine issues of Mighty Arrows and Mighty Champions have been released. To subscribe to receiving free digital copies by email, or to download your own free copy visit our Mighty Arrows and Mighty Champions page. There you are also able to subscribe to receive physical copies of the magazine sent directly to you. The St. Mary & St. Moses Abbey Press is a formal publishing company under the auspices of the Coptic Orthodox Diocese of the Southern U.S.A., specializing in publications founded on Orthodox Christianity, provided for the benefit of all. The press is closely affiliated with and under the guidance of the St. Mary & St. Moses Abbey. ©2019 St. Mary & St. Moses Abbey Press. The St. Mary & St. Moses Abbey is a community of consecrated monk-priests, monks and novices pursuing a way of life most closely resembling the communal, monastic life of St. Macarius the Great. The abbey is part of the Coptic Diocese of the Southern U.S.A. and is under the leadership of the diocese bishop, His Grace Bishop Youssef. The abbey is located in Sandia, TX. To contact the abbey, please visit their website contact page.